About a year ago I wrote a post on the subject of MMS and CD. Many people have since praised that post, but others have complained that it’s rather long (it is) and contains too much opinion. I believe that anyone that wants them should have easy access to the facts on this subject, and not just the information provided by proponents of MMS/CD use. With this in mind I’ve written this post as a summary of the basics. I ask only that you credit me if you use this to write an article. A mention of my Twitter account, @chronicleflask, or a link to this page will suffice. MMS stands for ‘master mineral solution’ or sometimes ‘miracle mineral solution’. It is a 22.4% solution of sodium chlorite in water. Sodium chlorite has the chemical formula NaClO2. So, MMS is 22.4 grams of NaClO2 dissolved in 100 mls of water. Sodium chlorite/MMS does not, on its own, act as a bleach. Sodium chlorite’s LD50 (for rats) is 350 mg/kg. This means that, on average, if you feed rats 350 mg of it per kg of body weight, half the rats will die. If we assume its toxicity is similar in humans (and there’s no reason it should not be) that means that 5.25 grams would probably be enough to kill an average 4-year-old child weighing about 15 kg. MMS is usually sold as ‘water purification drops’. Search for ‘sodium chlorite water purification’ in Google and you will quickly find it (usually alongside an ‘activator’ solution). Bottles for sale are usually 4 oz, or 114 mls. One quarter of one of these bottles would probably be lethal to a 15 kg 4-year-old. What is CD (or CDS)? CD is chlorine dioxide (and CDS stands for chlorine dioxide solution). Chlorine dioxide is ClO2. It is a bleach, used industrially to bleach wood pulp. It is also used to purify water and kill pathogens on certain foodstuffs. It is considered more effective than plain chlorine for water purification – it’s less corrosive and is particularly good at destroying legionella bacteria, as well as many viruses and protozoa. Chlorine dioxide is more toxic than sodium chlorite. It’s LD50 is 292 mg/kg (the lower the number, the more toxic something is). For this reason, the concentrations used in food/water applications are very low. The US Environmental Protection Agency have set a maximum level of 0.8 mg/L chlorine dioxide in drinking water. That’s 0.00008 grams per 100 ml of water. What’s the connection between MMS and CDS? 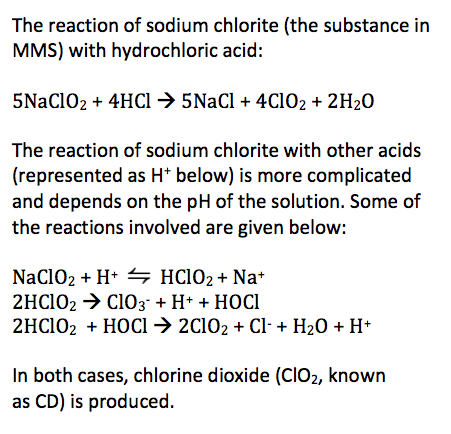 The chemistry of sodium chlorite (the substance in MMS) with acids. MMS + acid = CDS. The chemistry behind this is complicated. It’s simpler if the acid used is hydrochloric acid (HCl), and this particular method of ‘activation’ is sometimes recommended by proponents of MMS/CD use. If sodium chlorite is mixed with citric acid is used the reaction doesn’t happen in one step. Rather, chlorous acid (HClO2) forms, which ultimately breaks down to form ClO2. Several reactions are involved in this process. The concentration of chlorine dioxide in a solution made in this way is likely to be lower than if hydrochloric acid is used. However, it’s important to realise the the resulting solution is a mixture of harmful substances. Less chlorine dioxide does not necessarily mean safer. How much chlorine dioxide forms when MMS is ‘activated’? It’s not possible to answer this precisely, because it depends on several different factors. To begin with, it depends on whether hydrochloric acid or another acid (such as citric acid) is used. It further depends on temperature, and how much acid is added. We have no way of knowing exactly what someone mixing up these solutions at home is doing. A document on acidified sodium chlorite published by the Joint Expert Committee on Food Additives (JECFA) suggests that, at a pH of 2.3, a 50 ppm solution of sodium chlorite would produce 16 ppm chlorous acid (less at higher pHs). Starting with a 22.4% solution (as in MMS), and allowing for the stoichiometry suggested by the equations above, this could produce something in the region of 36 g of chlorine dioxide per litre of water. The US EPA’s recommended safe limit for chlorine dioxide is 0.0008 grams per litre of water. Compare this to 36 grams per litre. Even if only a fraction is converted to chlorine dioxide, the resulting mixture is likely to be tens of thousands in excess of safe limits. How are CD solutions used in food & drink production? Very dilute solutions, with just a few ppm of chlorine dioxide, are used as sprays or dipping solutions for poultry, meats, vegetables fruit and seafood. However, in these applications the chlorine dioxide evaporates from the food long before anyone eats it – it’s not present in the final food product. Chlorine dioxide is also used in water treatment plants, but the concentration in the final water supply is strictly controlled so that it’s less than the recommended safe limits. How are CD solutions used as ‘alternative treatments’? There are groups of people who believe that drinking CD solutions, or using them to perform enemas can cure any and all diseases, illnesses and conditions. However, there is no evidence that CDS is at all efficacious, and no reasonable mechanism has ever been given for its supposed mode of action. Jim Humble, who coined the name MMS ten years ago and sparked the use of these ‘treatments’, claimed that he worked with the Red Cross to successfully treat a group of malaria patients in Uganda. The Red Cross strenuously deny these claims. Other commentators have explained very clearly why Humble’s claims are impossible. There is a large group online, led by Kerri Rivera, who believe that CD solutions can cure autism. This is not true. Autism is a neurodevelopment disorder. There is no cure, although certain therapies may help those on the autistic spectrum to manage better in day-to-day life. The cause of autism is unclear, but it appears to have a strong genetic basis. Humble and Rivera advocate drinking CD solutions and/or using them in enemas. Protocols for such treatments involve adding drops of CDS to water, milk or other liquids. The number of drops used varies. Humble reportedly used 18 drops at a time in his malaria treatment. Usually this is added to further liquid, for example in a 250 ml bottle. Assuming a drop is 0.1 mls, this could be as much as 0.065 g of chlorine dioxide in 250 mls, or 0.26 grams per litre. Once again, US EPA’s recommended safe limit for chlorine dioxide is 0.00008 grams per litre. The amounts recommended by MMS/CD protocols are likely to be at least 3000 times safe limits, and may be considerably more. Protocols exist which recommend drinking these mixtures every one or two hours, eight times a day or even more. What would happen if someone drank a CD solution? Chlorine dioxide exposure may actually cause delays in the development of the brain. It would depend on the concentration. The very low levels used in normal water purification are not harmful (that’s why safe limits exist), however drinking large amounts (such as those usually recommended in MMS/CD protocols) would cause irritation to the mouth, oesophagus, and stomach. There is no evidence that chlorine dioxide causes cancer. 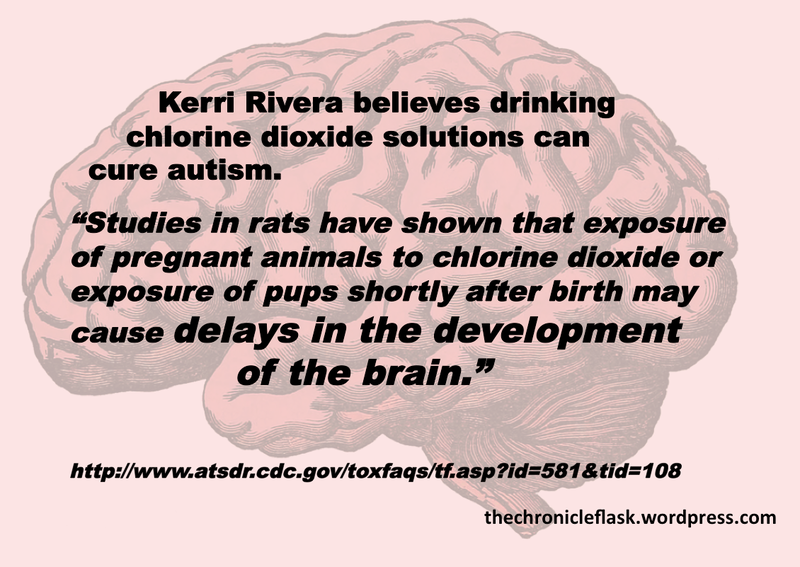 The ATSDR‘s (Agency for Toxic Substances and Disease Registry) entry for chlorine dioxide says that “studies in rats have shown that exposure of pregnant animals to chlorine dioxide or exposure of pups shortly after birth can cause delays in the development of the brain” (see also PMID: 2213920). Why are CDS enemas used, and what would be the effect? Rivera in particular advocates CDS enemas to kill the ‘parasites’ which she and her followers believe cause autism. There is no evidence for the existence of these ‘parasites’. Photos published online which purport to show them have been condemned as actually showing intestinal lining and mucus, excreted as the direct result of harsh enema procedures. Enemas, regardless of the liquid used, have risks. Repeated enemas can cause electrolyte imbalance, rupture of the bowel and damage to the rectal tissues. Enemas with CDS are likely to be particularly dangerous since it is corrosive. Proponents of CDS use claim it is ‘selective’ and only kills ‘harmful’ bacteria and parasites. This is not possible; chlorine dioxide is a strong oxidising agent and damages all cells it comes into contact with, regardless of the nature of those cells. Children have thinner tissues than adults. The risks of regular enemas, particularly with a corrosive agent such as chlorine dioxide, and particularly when carried out at home by someone with no medical training, are likely to be considerably higher for children. Is there any way to tell if someone has been using CDS in high concentrations? Unless someone admits to using CDS, there isn’t really any way to tell. For this reason there are very few reported cases of harm caused by CDS, as users tend to be extremely secretive. Unless an enema causes major trauma (which is a real risk) the symptoms are likely to be fairly vague gastrointestinal distress, which could be caused by any number of other things. There is no routine medical test to measure chlorine dioxide or chlorite in the body. There is a special test to measure chlorite in tissues, blood, urine, and feces, but the test cannot tell the extent of the exposure or whether harmful effects will occur. This test wouldn’t be performed unless exposure was expected. In other words, unless someone admits to using CDS on themselves or their child, it’s unlikely anyone will ever find out. Has MMS/CDS been in the news? If there’s no cure for autism/cancer/some other condition, mightn’t it be worth trying…? Medicine is all about risks vs. benefits. The benefit of using a particular treatment must always exceed the risk of using that treatment. In this case, there are no proven benefits of using MMS/CDS. There are considerable risks, as described above. The only thing MMS/CDS will do is make you feel sick and generally more unwell than you (or your child) might already. So no, it isn’t worth trying. Please don’t. Comments will be left open on this page for as long as it takes for me to tire of dealing with “you’re a pharma shill!”, “this is all lies!”, “watch this YouTube video that proves it works!” and “I drink it every day and I’m fine!” type comments. Annnnd that’s it. The most recent “you’re clearly paid off by corporations” comment has been deleted. Comments have been closed. Don’t go and comment on other pages: your comment will not be approved. Like the Chronicle Flask’s Facebook page for regular updates, or follow @chronicleflask on Twitter. This entry was posted in Dangerous chemicals, Food, Medicine and tagged activation, autism, Autism One, CD, CD Autism, CDS, chlorine, chlorine dioxide, chlorous acid, citric acid, Drops, enemas, hydrochloric acid, Jim Humble, Kerri Rivera, malaria, MMS, MMS/CD, MMS/CDS, parasites, ropeworms, sodium chlorite, water purification by katlday. Bookmark the permalink. Thank you so much for being a voice of reason on this and many other topics. I greatly enjoy and appreciate the clear and interesting way that you explain chemistry. Sadly, I didn’t get to study chemistry at school, but it is fascinating to see how it can give so much insight into how things work and are put together. Wonderful! Bloody hell, how many autistic kids have they killed? But wait, why should they care when they can make money on the back of someone else’s misery? They claim to have ‘recovered’ 225 children from autism. Of course, none of these cases have been written up in a reputable medical journal or anything like that. Given that autism is not considered curable by the mainstream medical profession, that’s quite amazing. You’d think at least one family’s case would’ve been written up, wouldn’t you? And that Rivera and co. would’ve been quite keen to crow about it. But no. It’s inexplicable. Only 225? Not very good then. I suspect their claims may be off by precisely 225. I wonder what their version of the scientific method looks like. Don’t joke. It’ll be neat sodium hydroxide next. Hey, it’s ‘natural’. THANK YOU for this article!! My mother has been pushing the MMS/CD protocol on me since my son’s diagnosis last year. I have been looking for scientific research to debunk the countless articles and videos she sends me. Especially regarding Kerry Riviera!! The whole idea of doing this to a child makes me sick to my stomach. We have always been a family of clean, organic foods so it didn’t surprise me that she would send me “natural cure” info but anyone who does the “protocol” to a child is taking the wrong approach. Therapy, diet, and patience is what an autistic child needs! Thank you again for these wonderful facts!! You are very welcome! I’m so glad it’s been useful. That’s why I wrote it, to provide a clear, fairly unemotional (I hope) explanation. Thanks for taking the time to comment. Did you know that Jim Humble, who possibly features in some of the articles your mother sent you, has since distanced himself from CD-MMS, saying “it cures nothing”? “MMS + acid = CDS” ….. Wrong!, CDS = ClO2 Solution is not “plus acid” the acid is already there, the difference is (as you may know) when you do the reaction (NaClO2 + Cl2) you got ClO2 and residues, when you do CDS, you “catch” the gas in distilled water, so you avoid the residues. Full of s#it… let’s see, where are the facts for the toxicity levels? Humans are not rats also, “(and there’s no reason it should not be)” false argument, there are thousands of variables you can’t assess so you can’t base neither support your theory on this. And WHY! you would feed 5gr of NaClO2 to ANYBODY, this is not ClO2 please educate yourself before doing this! “MMS + acid = CDS” ….wrong, the only way to have CDS is if you use two erlenmeyer flask one with distilled water and the other with NaCl2O + Cl2, tightly closed and joined with a pipe with the extreme submerged in the water, like if you were doing a “gas washing system” to catch the gas in the water, what is happening here is you are avoiding the residues of the reaction in the erlenmeyer with the NaCl2O + Cl2 reaction. This is plain wrong, the higher dose of chlorine dioxide is made with 30 drops of NaCl2O and 30 drops of Cl2, at 0.05 ml per drop you CAN’T have 36g as a result, your maths are wrong. “…can cure any and all diseases, illnesses and conditions…..” ……wrong! never was claimed that, in fact if you take the time to research and read, it’s stated this won’t be a magical solution that cures everything, even that does not work in everybody. “There is no cure” … again facts facts facts facts !!!! where are your damn facts! I have facts 🙂 If only you understand spanish will be amazing to share with you a video of a mother here in my country in my city with her son …CURED! woow! was that painful? Whaaaaat ??? large amounts ??? do you even know how much is the highest dose of chlorine dioxide ?? (yes you know because I said so before, 30 drops) that’s not a “large amount” come on are you serious? “…“studies in rats have shown that exposure of pregnant animals to chlorine dioxide or exposure of pups shortly after birth can cause delays in the development of the brain”…” …ohh! really ? 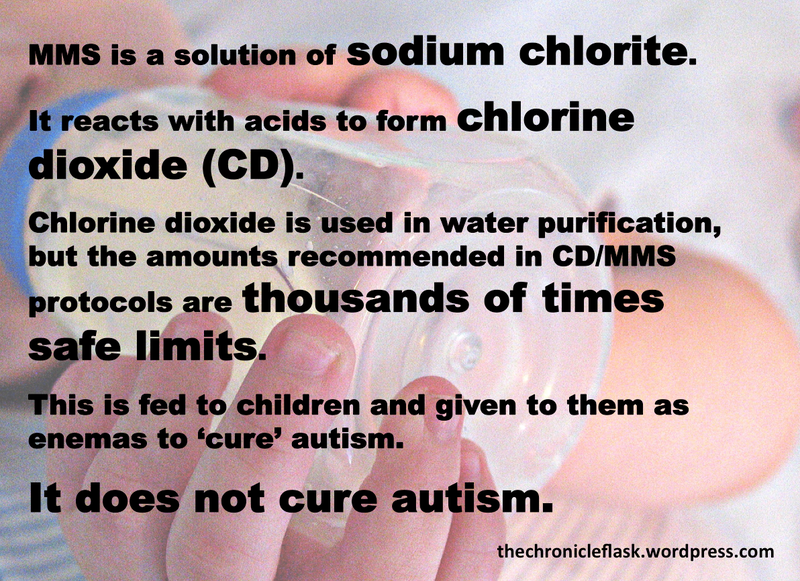 and tell me, are you waiting for a pregnant mother to give birth to give chlorine dioxide to the baby ? your arguments are so poor and bad my friend, typical of someone who strives to discredit something with no proofs, well let’s go on…. “…There is no evidence for the existence of these ‘parasites’…” …. yes there are, I provided a couple before, but if you want you can research more. You need to do an unbiased research of course, can you? “Repeated enemas can cause electrolyte imbalance, rupture of the bowel and damage to the rectal tissues.” …wrong again, please talk with a colonic hydrotherapy tecnhician and learn some new facts. Just for your knowledge, I trated my self (with a technician of course) with several enemas over 40lts of water each and didn’t have any problem, you know what? I improved my digestive system and more, go and research please before saying this nonsenses. “…CDS are likely to be particularly dangerous since it is corrosive….” …..well again concentration levels, and you need to remember ClO2 is an oxidant with the lowest level of oxidation/corrosion with 0.95v then comes bleach with 1.49 and so on till ozone with 2.07v thought exists ozone therapy and nobody gets killed for that. “This is not possible; chlorine dioxide is a strong oxidising agent and damages all cells it comes into contact with, regardless of the nature of those cells.” …. Oh “that’s not possible” why ? because you say so ? and what about the experiments I submitted before above with people drinking really high doses of ClO2 and had no problem with cells and anything ? that is not possibe also ? the fact that you don’t believe or you don’t want to believe, doesn’t make it impossible you know. By the way your PhD includes a Biology major? how do you know how the ClO2 interact with the cells ? are you supposing ? are you gonna say “probably damage” ? what about HCl in the stomach ? isn’t that corrosive ? isn’t this acid intaracting with cells? AM I DYING !!!!????? sorry just a joke…. I read each one of the articles you linked, no one gives any conclusive facts nor provides proofs, insted they use words like “potentially dangerous” , “potentially lethal” but they don’t proove anything. Other article says (I quote) “Experts said it is untrue any such mixture could cure autism and warned its use could lead to serious harm or death” and I say “jumping rope could lead to serious harm or death” isn’t it? imagine you falling and hitting your head over a rock!! you can be dead really….and again lot of “potentially bla bla bla” you know….I’m a potentially millonaire!!! 🙂 let’s see when this comes true! And the one I like most “The fake cures for autism that can prove deadly” but in the f#cking whole article they DON’T prove it is deadly even harmful … ““MMS can cause serious damage to health and in some cases even death,” says a spokeswoman for the Food Standards Agency (FSA)” oh really spokeswoman ? are you a doctor ? a biologist ? who are you ? where are the facts ? in which cases ? Did you know that more than 290 persons are killed for drugs approved by the FDA ? You know that your loved FDA has approved an IA application that predicts your death ? So jokes apart, and sincerely sorry for the tone of the whole thing, I was pissed off I’m not going to hide my feelings about your article and your words, I can’t imagine why you decided not to think and just repeat what you saw everywhere. You know writing in the internet is a responsability, if you don’t have facts then don’t write, you are confusing people. At first, I was like you, I thought this MMS thing was wierd, I was against it, suddenly I realized that without experiment there are no data to have conclusions, and I tested in me, I tracked my use, nothing bad happened to me and some good things happened, I can’t say is the cure for everything, I can say it’s not a menace for your health and some good stuff can occure. I had a chronic infection in my nasal sinus and throat, and some skin issues, both dissapeared. As you can imagine I don’t use medicines 🙂 so no, I wasn’t taking anything else was a very well isoleted experiment. I can talk by me, by my body, I can assure for everyone in the world but, there is a fact hiting the door, lot of people is using it, and I saw people improve so in the absence of scientific studies, practice serves as a reference (I said REFERENCE, just in case). Now I’m testing something new (may be you want to write about this also) DMSO, I will have my conclusions in about a month or so. I’m not holding a PhD, I hold my brain, I use it and I don’t believe in nothing that can’t be proved or tested with numbers, and internet? wikipedia? gossip? no, that is no data to be trusted, and yes, economical interest moves the world, enough to cheat people, does not matter if it is 1, 100, 1 million or the whole earth, you need to understand that there are people that does not care if you are healthy or sick, they care about their wallets, thought they can’t take anything of that to the other side…. sad, but true. What’s your point? That feeding children solutions with high concentrations of chlorine dioxide is safe? It isn’t. Nor is it effective. Your chemistry is incorrect. In particular it appears you don’t know the difference between chlorite (ClO2-) and chlorate (ClO3-). My point is, that you are saying “It isn’t, Nor is it effective” without any proof, without data that backup your claims, that you think that because you are a chemist you can say “this is not effective because I say so” and the people needs to believe in this with no proof at all, that’s my point that you offered ZERO fact backing your reasoning, that you are based only on what you “think” is bad without conducting ANY experiment so how can you talk about something that you don’t know? and you don’t have any studies run over this matter…. it’s wierd that you try to convince everybody that something is “bad” but you don’t have any proof of what you say, and in the best scenario you use ambiguous information “given by the FDA” which has demostrated not to be trusted. So… sorry but you have no case on your hands my friend. And yes, I know the difference between chlorite (ClO2-) and chlorate (ClO3-) I may have done a mistake while I was writing but is not rocket science. Trying to divert attention with this is a bit lame don’t you think so? I have proof, in that we know that chlorine dioxide is harmful to humans in the doses suggested in these protocols. And yes, it IS chlorine dioxide that’s produced. It would be wholly unethical to carry out “studies” of a substance we know is dangerous and which has no plausible mechanism of action. Even Humble himself had admitted that MMS (and therefore CDS) “cures nothing”. This is the last time I’m going to reply to this.